The predictive information contained within a user’s text can be characterized by three related quantities, the entropy rate h, the perplexity 2h, and the predictability Π….We applied a nonparametric entropy estimator that incorporates the full sequence structure of the text. This estimator has been proved to converge asymptotically to the true entropy rate for stationary processes and has been applied to human mobility data. In other words, it’s pretty much incomprehensible. However, it’s incomprehensible in a way that appeals to me, so I read it. I’ve got an hour or two to kill right now, so why not? 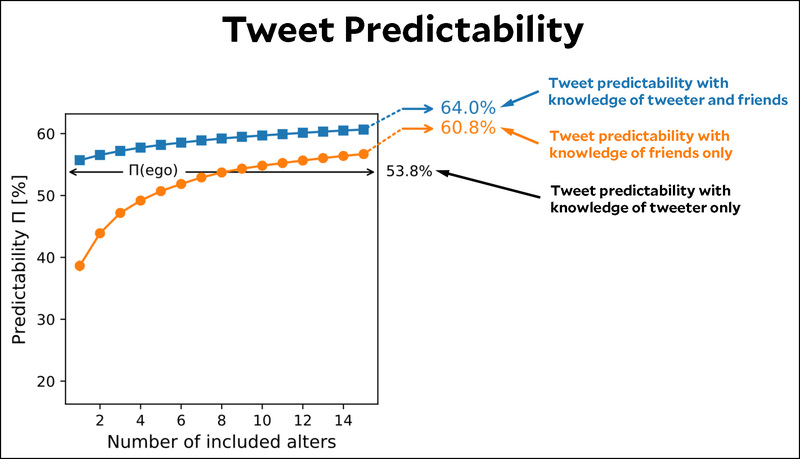 The authors are looking at something very specific when they talk about “predictability.” They analyzed the Twitter feeds of about a thousand people, and for each tweet they tried to predict what the next word in the tweet would be given the person’s past writing. Their question is, if you look solely at the writing of the person’s friends on Twitter, how accurately can you predict what they’re going to say? It turns out that this depends on how many friends you look at, with predictability topping out at around 15 friends. This may have distinct implications for privacy: if an individual forgoes using a social media platform or deletes her account, yet her social ties remain, then that platform owner potentially possesses 95.1% of the achievable predictive accuracy of the future activities of that individual. In a nutshell, this means you can delete your Facebook account all you want, and it barely matters. If I already know who your friends are, I have a continuing stream of information about what things you’re likely to buy and which candidates you’re likely to vote for. This paper, obviously, uses a very restricted meaning of “predictability.” Nonetheless, it’s suggestive that other kinds of predictability may be accessible through your friends too. If your friends like guns or beauty supplies, there’s a pretty good chance that you do too. Likewise, if some hot new fashion hits the stores and your friends all hate it, you probably hate it too. And if your friends seem to be undecided about a political candidate and are potentially persuadable with a specific message? Well, you probably are too, even if you insist that you are truly a unique snowflake uninfluenced by fads and peer pressure. In other words, we are all doomed. Unless you can convince all your friends to abandon social media, it barely matters if you yourself do. Big Brother is still watching.